Sandbar friend Alison created our fantastic pint glass design for Valentine's Day. We asked her a few questions about her Sandbar experiences through the years. You can find Alison online in a variety of places: at her personal blog, her professional design site and on Twitter. What's your favorite jukebox song? Everytime I go to Sandbar, my friends always overload the jukebox with Disney and Grease soundtracks. So I'm going to say "You're the One That I Want" has to be a favorite, since it's inevitably played every time I'm there, but there's few things I love more than hearing "Sweet Caroline" or "Friends in Low Places" getting belted out by everyone in the bar. Tell us about the first time you came to the Sandbar. I'm not sure I actually remember the first time I went to the Sandbar, as it was shortly after my 21st birthday (to be fair, that whole year is pretty blurry). But I do remember one of the first times we ever went we played upstairs in the sand most of the night. The cutouts are so funny, they should start making more apperances downstairs! I also remember scouring the fish tanks and giving names to our favorites, and obviously doing the car wash after dirty banana shots. Favorite drink? I can usually only do one or two tropical drinks before hitting a sugar high, but I always have to have at least one shark attack every time I go. Also, dirty banana shots are the greatest shots known to man. What's the longest you've waited in line? The only time I remember having to stand in line for a really long time was the first time I brought my mom and her friend. They had never 'partied' in Lawrence with me before, and I knew they would have a total blast at The Sandbar. We thankfully only had to wait about 30 minutes or so, and it was well worth it. ...which leads to my funniest memory of The Sandbar. I had promised my mother a legendary hurricane, and once again, it did not disappoint. I think the best time I ever had at The Sandbar was doing a hurricane and singing "Car Wash" with my mom standing on the benches, Bahama Mamas in hand. We laughed so hard, she had the best time. Favorite memories at The Sandbar? My favorite memories of The Sandbar HAVE to be the birthday parties. My friends and I have been for the past two years, and they are legendary! We took about a gazillion pictures in the photobooth, they're still hanging up in all of our apartments. And last year we got a picture with Coach Self! It's also a lot of fun with the live bands and shutting down the whole block, it's like Sandbar just takes over all of downtown for one night a year! Favorite drink trinket? I think my favorite drink toys are the Shark Attack sharks, I have more than my fair share of them. I really want to figure out a way to display them properly. Brenna suggested making lights out of them by stringing them on a strand of christmas lights, I think that would be so much fun! Where can you be found when you're not at The Sandbar? When I'm not dressing up as a mermaid for the 11th time (seriously, Erin and I have a contest going to see who can be a mermaid more times than the other. Is there a Guiness World's Record entry for that yet? ), I am a Graphic Designer for the Lawrence Journal-World. In my free time I enjoy traveling as much as possible, cheering on the Jayhawks to assured victory (while biting my nails and yelling at the TV), and fighting the effects of my late nights at Sandbar with pilates, soccer, dodgeball, and kickball. Hey friends! Well, the video entries are in, and it's time to vote for your favorite! We got one last minute entry, and since we're nice, we accepted it. There's a total of nine videos- watch them all and choose the one you like best. Send it to your friends! The winner will get a year's worth of free sandwiches from the newly opened Sandbar Sub Shop (inside Zarco66 on East 23rd Street), and their video clip will be featured in our next hurricane video. You've got a week to vote- the poll closes next Monday. Good luck to all the entrants! Our Man on the Street Pat may have finally lost his throne. Bartender Nic appeared on the LJW's "On the Street" section yesterday. Apparently he was cornered while pumping gas. If you haven't met Nic, come by on a Monday night. He's behind the bar from 5-9 on Margarita Monday. "When you and your partner travel, who does the driving?" Does he not want her driving because she's a poor driver? Or because he's worried for her safety? Or is it because she doesn't like to drive, so he wants to make her happy? I don't have an answer to that question. Ask him if you see him. St. Patrick's Day- On The Way! One thing that excites us every time a new year rolls around is the fact that St. Patrick's Day- our favorite holiday!- is near. March 17 may not seem near to you, but trust me, this part of the year flies by for us. The decision-makers met for lunch yesterday and this year's float theme was unveiled. Of course it's still a secret, so don't expect me to spill the beans here, but it's a good one. Of course. This year's theme was inspired during a random impromptu pool party last summer. We've got the float, the music, and even the costumes nearly figured out. And honestly, we can't believe we've never come up with this one before. What do you think our best float ever was? A few years ago we asked this question, and the readers chose the Love Shack float from 2003. Here's another poll, with some more recent float selections. Vote for your favorite, and if it's not one of the choices leave us a comment! If you can't remember some of them, check out our St. Patrick's Day archives for stories and pictures. What's The Best Gift You Gave This Year? Lots of people talk about the gifts they got for Christmas (or whichever holiday they celebrate this time of year), but you don't hear very many people talking about the gifts they gave to someone else. What's the best gift you are giving someone this year? What about you? Add your favorite gift in the comment section. It doesn't have to be expensive or creative or particularly spectacular...just the one thing you gave someone that was perfect. I'm grateful for the multiple Tuesday evenings I spent at The Sandbar drinking $1.50 Sapphires on the rocks and having singalongs with people I didn't know. And trying to feed the fish popcorn through the glass. Ahhh $1.50 anything Tuesday....so choice. I am grateful to have survived the last year stronger & happier than I could have thought possible. Sometimes the worst events of your life can end up being the biggest blessings. I am lucky to have such incredible friends (new & old) in my life. The Sandbar has certainly served as the back drop to many of this years "moments." Thanks Sandbar! I'm grateful for the Sandbar - that is when I get a chance to go there! Last week, we asked a question: where do you want to see our pictures online? Currently we're putting them on Flickr so that anyone can see them without signing up for something; but if our fans would rather see them on Facebook (or both), we want to accommodate. The poll closed on Saturday, and the masses have spoken. All 24 of them. We appreciate those who took the time to vote, and we especially appreciate that none of you chose the "Nowhere, I don't care" option. It looks like you'd rather see our pictures on our Facebook page, and a lot of you think we should put them on both Flickr AND Facebook. So, that's what we'll do. From now on when we add new pictures, we'll put them on both sites. As we have time, we'll go back and add the pictures already on Flickr to Facebook, too. Thanks for voting, and we'll do another poll soon! If you have a question to suggest, leave it in the comments. I'm trying to figure out the best way to share our favorite Sandbar pictures. We have a Sandbar Flickr photostream, and we also created a Sandbar Flickr group that you can join and add your own Sandbar pictures to. The photostream is available for anyone to see, but you have to be a Flickr member AND a group member in order to see the pictures in the group. The reason I set up the Flickr photostream and group was because I wanted a place to share pictures without requiring you to register or sign in to another site. However, is it inconvenient? Does anyone use Flickr, or visit our page? 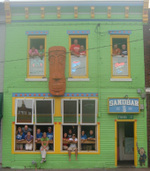 I've thought about adding pictures to the Sandbar Facebook page- either instead of or in addition to Flickr. But I know that not everyone is on Facebook (yes, it's true- my mom's not!) so I don't want to restrict the non-Facebookers from seeing our pictures. So, I'm asking you. Here's a poll. Pick an answer. (Isn't this poll cool?!?) Feel free to share with your friends. Poll closes on Saturday, October 10. A little over a week ago, I posted a new random question over on the right side of the page. This time I wanted to know what your favorite jukebox song is. There could have easily been a hundred options to pick from, but for lack of space and time, I picked a few songs that seem to be played over and over, every night. I also gave you the choice of "something else." I have to admit, I'm pleasantly surprised that this option didn't have more than half of the votes! That tells me I did a decent job of picking the popular songs. I was glad that so many of you left comments (on here, Facebook, and Twitter) about your other favorite songs! And my all-time favorite sing-along song, David Allan Coe's "You Never Even Called Me By My Name." Any suggestions for the next poll question? Leave a comment with your idea.